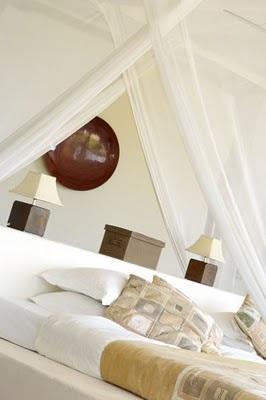 Luangwa Safari House to be even more exact. In this double-height main room, hand-painted fabrics from a local factory pair with furniture and lamps made by local Lusaka craftsman. ah la la..! yes i'd join you there at once ! love love this living room and every detail..
the napkins folded in swan shape...exquisite! thank you for making me dream!! There is a young couple in our subdivision who do this, periodically. Not sure where they go or where they stay, but I've seen the amazing photos she has captured on these "safaris". When you win, will you take me too?!! Wow, that is an amazing place. Everything is so stunning and gorgeous! I want to sit in a pool and watch elephants! Oh, and to have someone bring you your wine... oh, wait I already have Dan for that:)! Pat...it has been a dream since I was a little kid to do a photographic safari. These places are on Robin Cooks property...looks like he does safari well! Lala...Oh I hear ya. They say it is perfect for families. I'm game if you are! Oh my, is this heaven or what? All the things I love--water, weathered wood, wine in glass stemware, sheers, white stucco, and napkin folding! What a way to escape our burned-out Florida gardens! Thanks for the eye candy!!! I am drooling over that copper tub. I love the walls, the staircase, the roof line, the whole bit. And to sit in the pool and watch the elephants... It just doesn't get much better than that! Now THAT would be the holiday of a lifetime. Too gorgeous and exciting! I'm buying a lottery ticket later. Can I go? I really want to go to Africa it's on my bucket list. Always wanted to go to Africa...what a treat it would be to experience the luxury in the midst of the wildness of what's beyond this place! Ooh paradise! If I went there, I think I would be tempted to stay forever. OMGosh, Linda! Do you need anyone to carry your bags?! These images are amazing and I think they capture the atmosphere better than most any other pictures that I have seen. I must go back and look again. Wow. Wow. The timing of this post is impecable. I've been begging my husband to go on a trip to Africa, and his "third world" paranoia makes me think we'll never get there. I'll have to show him these pictures for sure! Doesn't heaven look a little like this!!? That handpainted fabric is gorgeous! I'd love some of that for my home. I truly feels like another world to me! Lovely post.. I really like the phrase "photographic safari", and the use of origami in that table setting! what an amazing post! thank you for taking me to a far away land. Now back to reality for me:( haha. Thank you so much for the sweet comment and for stopping by my blog!! thanks for the virtual safari today!! when i was little, i wanted to travel to africa on safari, but more like "out of africa" (the movie)...now that i am older, i could soooo see myself at a resort like that one!! just gorgeous! Oh wow, how nice would that be! I would absolutely LOVE to visit that exotic tree house. My kids would NEVER want to leave. How marvelous ! Thanks for the link. Will be bookmarking under "dream vacations." Why luvins I thought you'd neva ask! I'm packin. ABSOLUELY GORGEOUS! I relaxed just looking at the pictures. What am amazing place. You are a travel agent for the rich and famous aren't you? Oh ... I want to teleport myself there right now!!! My favorite trip (twenty years ago or so) was to Kenya on Safari. It was amazing ... beautiful... awe inspiring. It didn't quite look like this though! I am in! Check out those napkins! That must mean I'm detail-oriented if THAT"S what I picked out of all that! ha! Those pictures are absolutely stunning! Linda, I have researched them. I was surprised to see how expensive they are. Same with the Orient Express. Maybe someday. If you win the lottery will you adopt me before you go on your trip? I am so with you on this...Africa would be at the top of my list too. I really want to see the animals. I didn't know that such a house existed. Thanks for pointing it out - now I can expand on the Africa dream. Holy WOW! That place is absolutely incredible!! Imagine waking up to elephants grazing in your yard? Crazy cool! Thanks for that little get-away. I needed it! It's COLD and GRAY up here in NY today. Please...please can I come around ? It is so cold in my little swamp-land behind the dikes in the north ( Netherlands ). Who needs the lottery when I can use my tax return...plus...I think we need to add a trip to Matemo island as well. Doesn't matter if my tax return digs our family out of financial mess each year (medical bills, etc...) I'll just go there...but seriously...if I won the lottery...I could pay my bills and take my family too! Blessings. Count me in! What an amazing, beautiful place. It really is dreamy. If you can't relax here, then truly there is no hope for ones mental state!!! I feel transported...thanks for the lovely weekend images. I have never been on one but have several friends and family that have gone..they say...trip of a liftime! My kind of holiday too:-) HEAVEN on earth! I am so coming. This absolutely incredible. The stuff dreams are made of...much better than seeing elephants in a zoo!